The findings from scientists at Columbia University’s Lamont-Doherty Earth Observatory, Cornell University and NASA provide new insights into the role temperature plays in megadrought risk and how our choices today can affect water resources in the future. The scientists found that even if the Southwest receives more precipitation than it does today, rising temperatures will still push the region’s megadrought risk above 70 percent by the end of the century if the world continues on a high-emissions growth path. That rises to 90 percent if precipitation levels are unchanged. If the Southwest gets less precipitation – a more likely outcome according to most climate models – the megadrought risk rises to 99 percent across most of the region. 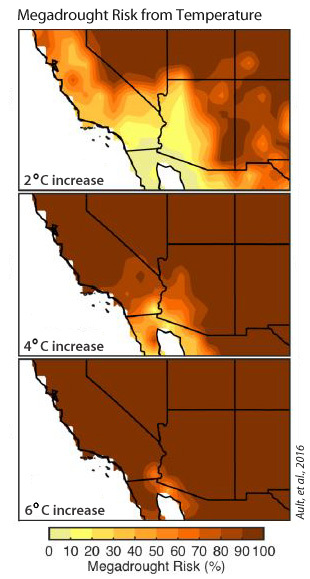 To assess future megadrought risk, the scientists used computer simulations of the Southwest’s climate, soil moisture content, and relative dryness based on temperature and precipitation. They tested what would happen under a wide range of precipitation levels and temperatures that could occur through the second half this century. If the world instead cuts its emissions to levels close to those agreed to by international leaders at the Paris climate talks last December, meeting the IPCC’s RCP2.6 trajectory, the Southwest will be about 1.9°C (3.4°F) warmer in the second half of the century compared to the second half of the 20th century. Megadroughts will still be more likely than today, but the probability is less than 66 percent with no change in precipitation, falling below 50 percent with a modest increase in rainfall, the study found. The Southwest has experienced severe droughts in recent years and the water shortages they create, but those droughts have so far been relatively short-lived. A 35-year megadrought would put unprecedented stress on the region’s water resources, the authors write. Communities can take adaptation measures, such as shifting to more efficient irrigation techniques, increasing water use efficiency, planning water transfers, or implementing measures to reduce demand. But to know how to manage water resources for the future and prepare, they need to understand each region’s drought risk. Toby Ault, the paper’s lead author and a professor at Cornell University, noted that parts of the normally verdant Northeast are also in drought right now. “This should serve as a cautionary note for areas like the Northeast expecting to see a more-average moisture supply,” he said. The other co-author of the paper is Benjamin Cook of NASA-GISS and Lamont.